Despite their south-of-the-border roots, nachos have a chameleon-like ability to fit into any cuisine. We’ve had good luck before with Big City’s Mediterranean Nachos, so when the opportunity arose to try Irish nachos (oh, the possibilities! Potatoes! Beer??) on our Denver vacation, we jumped at the chance. 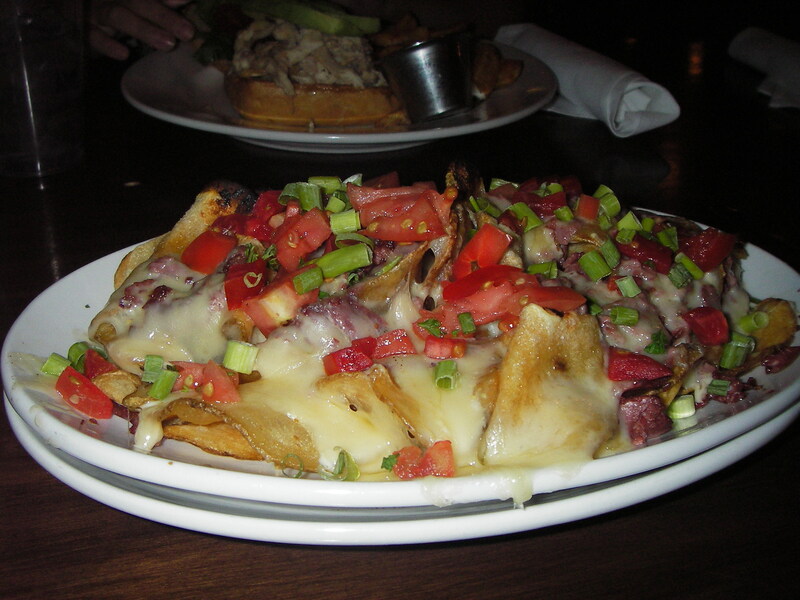 Jordan’s, an Irish pub on the edge of DU, provided us with these beauties: kettle-fried potato chips topped with corned beef, swiss cheese, horseradish dijon, tomatoes and scallions. Appearance: (8 ) Colorful, not too gooey, but still exciting. Quality of Ingredients: (9) We are mildly obsessed with potato chips. Kettle chips, even more. These were clearly house-made and delicious. The corned beef was equally sublime, and the dijon creation added a nice zing. The tomatoes and scallions were fresh and delicious, and swiss cheese added a nice mellow flavor. Distribution of Toppings: (8 )There was little viscosity in the toppings on these nachos; then again potato chips work better without toppings than do tortilla chips. However, they made the dish as a whole heavy to eat, and when they did get a little soggy, they became immediately unpalatable. The cheese was distributed well, although we could have used a little more of the corned beef. Price: (7) Everything in Denver is cheaper than in Boston…except for these nachos, at $9. Overall: 32/40. We traveled from Boston, land of the Irish, to Denver, land of delicious Mexican food… and found a delicious Irish take on Mexican food. There’s a conclusion to be drawn from that…somewhere.